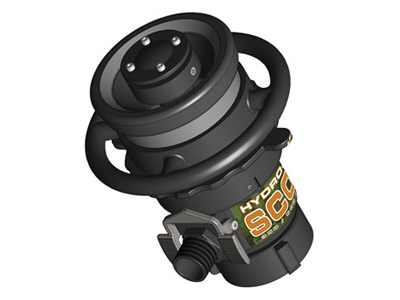 The SCOUT nozzle from Williams Fire & Hazard Control is a self-educting monitor nozzle with selectable flow rates of 350, 500, and 750 Gpm (1,320, 1,890, and 2,840 Lpm). Constructed using a lightweight, non-corrosive composite material, anodized aluminum, and stainless steel, it is an extremely versatile and durable nozzle purposely designed for the harsh operational environments encountered in industrial firefighting operations around the world. 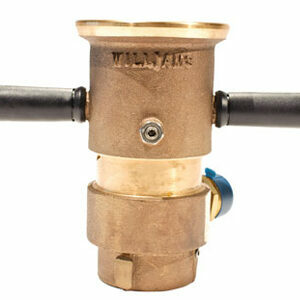 The SCOUT nozzle from Williams Fire & Hazard Control is a self-educting monitor nozzle with selectable flow rates of 350, 500, and 750 Gpm (1,320, 1,890, and 2,840 Lpm). Constructed using a lightweight, non-corrosive composite material, anodized aluminum, and stainless steel, it is an extremely versatile and durable nozzle purposely designed for the harsh operational environments encountered in industrial firefighting operations around the world. The composite material has undergone extensive testing including accelerated aging followed by extensive dimensional analysis of the constituent parts to assure its durability and fitness for optimum performance. The SCOUT Nozzle is the latest in a series of innovative lightweight Hydro-Foam™, self-contained foam systems. Selectable flow rate of 350, 500, or 750 Gpm (1,320, 1,890 or 2,840 Lpm) to match available water supply or required foam application density. Onboard selection of foam proportioning rates of 1% or 3% at 100 psi (6.9 bars) operating pressure for various foam applications. 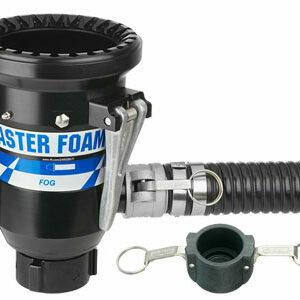 Use as a water only “Master Stream” device when foam is not needed by simply disconnecting foam concentrate supply. Built-in flush setting as recommended per NFPA 1964. 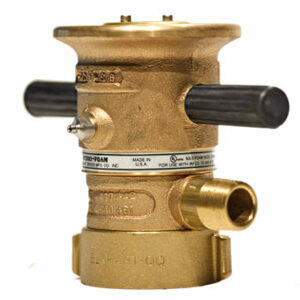 Change flow rate, proportion rate, or flush without the need to shutdown operation. Positive lock for rate selection. Self-contained internal stream straightener to deliver maximum reach. Wrap around handle for easy adjustable pattern control from full fog to straight stream. Light weight at 6 lbs for a complete unit. 2.50” (F)NST Swivel inlet connection. 1.00” (M)NPT foam inlet port. Available with or without 1” x 8’ (25.4 mm x 2.4 m) vacuum rated clear concentrate pickup hose with 1” (F)NPSH coupling on one end.